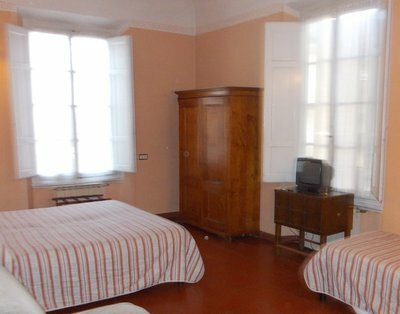 Only showing entries about budget hotels from Backpacking Europe on fifty dollars/day. View entries about budget hotels from all Travellerspoint blogs. 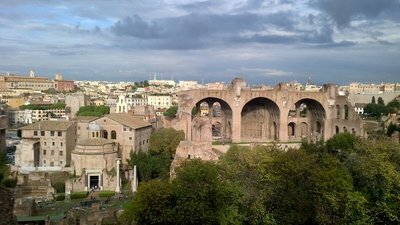 Rome, the eternal city, built on seven hills, located on the Tiber River, the capital of Italy is home to almost three million people and has been in existance since 730 BC. We are going on the free walking tour which in my mind is at the Spanish Steps at eleven am. We walk four blocks from our hostel to the central train station and buy metro tickets, they are one euro fifty each and good for over an hour. The train is packed. We get off at Spanya station, find the Spanish steps and wait around. Really busy, all kinds of people taking pictures and we take pictures too. Today is Sunday. It is not cold but you need a light jacket and it is overcast so the pictures will look dreary. A band comes marching into the square, looks like the Salvation Army, it is all quite jolly. 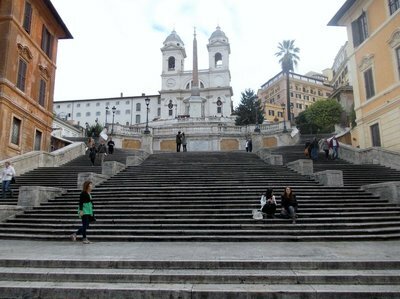 Rome is a hilly city, thus the need for the steps to get to the church at the top. The Spanish Steps should have been called the French Steps as the church at the top is a French church and France paid for the steps. But the Spanish Embassy must be here and also Keats used to live right next door and now there is a Keats and Shelley museum just to the right as you face the Spanish Steps. There is also a fountain with a statue of a ship at the bottom of the steps and a nice picture taking opportunity. There are all kinds of underground springs feeding the fountains and the water is suppose to be good but I am not taking any chances and stick with bottled water. At ten past eleven I dig out our notebook and discover the tour started at ten but there is another one at four. OK. All is not lost. We climb to the top of the Spanish steps (156 but who is counting?) and take some pictures, then walk around. 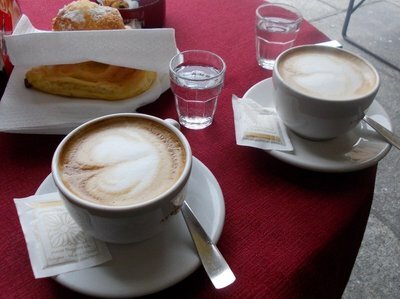 The first coffee shop we come to is a definite stop and we enjoy a cappuccino, I like a good coffee to start my day. Expensive, though, when you sit outside, cheaper if you have it inside, likely standing which is not my favourite thing as I like to sit down and rest when I get the chance. I am sixty three and being a backpacking budget tourist is really exhausting. So we look at the map and decide we will see the Trevi Fountain and all the sights along the way. We walk down the street where all the expensive stores are, Gucci, Prada, etc and I take a few pictures of things I will never wear, or own and really who cares. 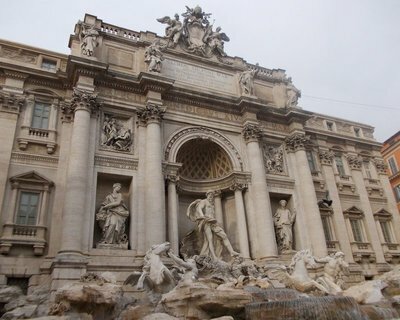 We get to the Tiber River and snap a few shots, and when we are close to Trevi fountain, stop for a quick lunch of pizza and sandwich and water, shared. The Trevi Fountain is really spectacular, crowded with people, but there are seats along the wall and we score a spot and sit awhile enjoying the view and the idea, here we are at the sight where so many people have been, movies have been shot here, people have cavorted in the fountain and we throw in coins and take pictures like everybody else. Now we walk to the Borghese Park which is a city park next to the Borghese Mansion. We take a circuitous route and by the end of the day we for sure will have walked ten k if not ten miles. There are some tremendous views of the city and lots of people are walking, we make our way back to the Spanish Steps, walk down 156 steps, and wait for the four oclock tour which we never did find. Oh well, I really do not know if I was up to a two hour walking tour that would have ended at six pm and we would have staggered home in the dark. As it is I am complaining at the metro when we take the wrong door out, I do not want to walk one extra step. We stop at the grocery store and buy instant cappucinno for the morning and also little dixie cups of gelato. Yummy. Back in the room, eating my gelato, savouring it, I feel rejuvinated. Tomorrow is another day, maybe I will sleep well tonight and tomorrow we will go to the Colosseum. 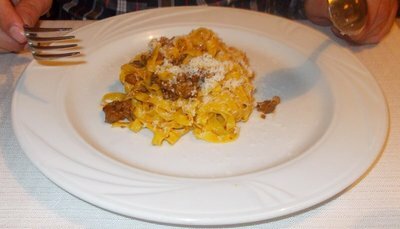 I think we did quite well today, saw some sights, got a good handle on how the subway system works, walked in a city park with Roman families pushing prams and leading dogs on leashes, no rain, a fine day. We flew out of Calgary two months ago, Sept 19. We have been to Sweden, Finland, Estonia, Latvia, Lithuania, Poland, Slovakia, Hungary, Serbia, Romania, Bulgaria and now we are in Italy. A note about Calgary, Europeans know it first for the Flames, second for the Olympics and third for the Stampede which they seem to think is barbaric. Have you been to the Colosseum?? Built to seat 75,000 spectators, up to 65,000 people would be given free passes to watch gladiators duke it out. During the half time show they killed Christians. It would have been quite a spectacle, there are elevators built in to bring the animals, maybe lions, onto the stage from underground cages. 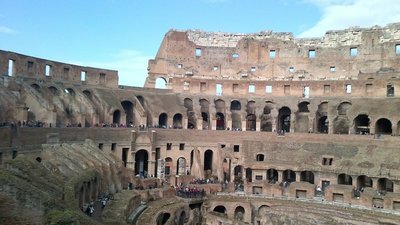 The admission to the colosseum includes the Forum and Palentine Hill and costs 12.50 euros but we bought a Rome pass which includes free admission to two museums and unlimited rides on the metro for three days. Costs thirty euro and saves a lot of time if you are taking the train. Also you bypass the line up at the Colosseum. We spent at least four hours walking around these sights, maybe a total of one hour sitting. Then we went to the museum near by, more recent history, wars of independence, emigration, first world war, etc and numerous stairs of the Vittoriano which are worth it for the views of Rome from the terraces. This is a stunning building, very white with many statues outside, really dominates the landscape and is not well liked by residents apparently but us tourists just love it. Rome was not on my bucket list but it should have been. Tick. I don't have a bucket list but going to Turkey was a vague kind of goal. Tick. Tuscany was not even on my radar until I noticed Siena was close to Rome. 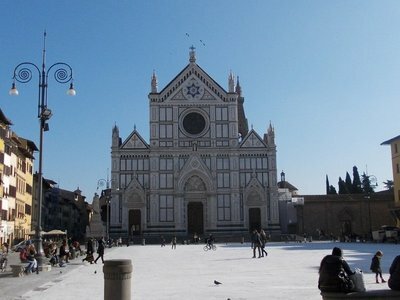 Then as it turned out our cheapest flight from Izmir to Italy brought us to Bologna, therefore to Florence and into Tuscany. It has rained during the night and a bit of gentle rain in the late afternoon today, but still quite warm, the roses are blooming on Palentine Hill and the oranges are hanging on the trees, they are in season here too. Not exactly shirtsleeve weather but a light fleece jacket is enough and you can still sit outside and enjoy a coffee or a wine at an outdoor cafe. Actually it feels a bit like spring, but the leaves are starting to turn. I have seen more maple leaves in Europe than I ever see at home in western Canada. Here they cover the sidewalks on some streets, all golden colour. In Finland they were shades of red, maybe because it is colder there. 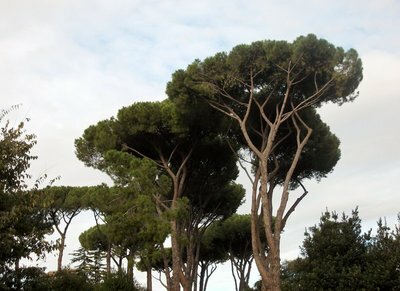 However, the trees that signify Rome to us are the striking umbrella pines. Most major European cities have a free, donation accepted, walking tour. We find them informative, a good orientation, an interesting introduction. 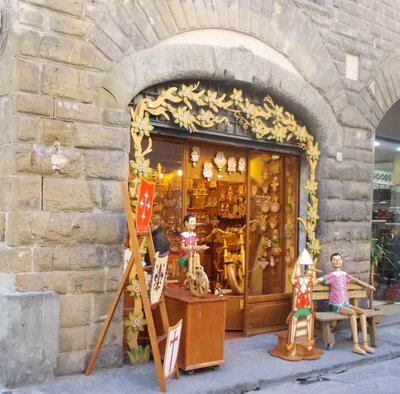 The walking tour usually lasts about two hours and the distance covered could be four kilometres, you start out at one point and finish somewhere else. On the Rome walking tour the starting point is near the Spanish steps and on the Vatican walking tour the finishing point is St Peter's Square. OK this is Tuesday and we finally got on the free walking tour. First it turns out that it does not operate on Sunday so we wasted a fair amount of time on Sunday hanging around the Spanish steps looking for the tour. Then we were all set to take it Monday but for the first time on this trip I slept in and we did not get going til after ten. So we missed it. We did think we might hook up with the four pm tour but after all those hours at the Colosseum, etc we just could not take a walking tour plus we would have had to rush to finish up at the Forum. So today we made it to the Spanish Steps and could not see any tour. Wow. This was bad. Then it turned out the tour starts by the Spanish Embassy which is just down the block and thank goodness we managed to participate. After a brief stop at the Spanish steps we walked down the Fifth Avenue of Rome and looked at Prada through the windows. Then we stopped at Piazza Navona the baroque square with Bernini's Fountain of the Four Rivers which is every bit as impressive as the Trevi Fountain. We saw the Parliament Buildings also and the Shell Fountain. The highlight of the walk was the Pantheon. Raphael is buried here. Also a bunch of kings. The cement dome is forty three meters wide and forty three meters tall, it has no windows as windows would jeopardize the integrity of the structure. Instead there is an opening of nine meteres round in the roof of the dome. This is the only source of light. When it rains it rains into the Pantheon but holes strategically placed in the floor carry the water away. 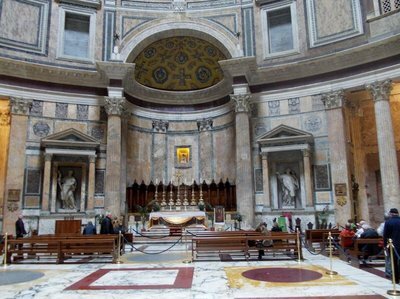 The Pantheon is so well preserved even if the bronze from the columns out front was removed and recycled at St Peters Basilica and the white marble that covered the building inside and out has been removed. 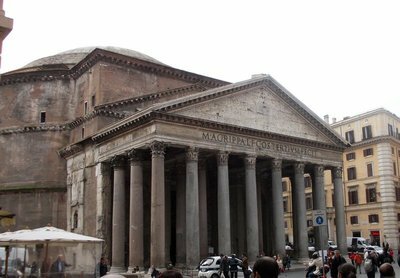 The Pantheon started out as a temple to some other gods but became a Christian church, therefore as in all of Rome, as a church, there is no admission. 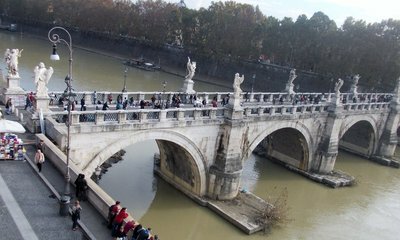 We walked over the Tiber on the Angels Bridge, designed by Bernini. Two of the angels were done by Bernini, the rest by his school. On the other side of the Bridge is Castel Sant Angela where the pope used to live. There is an old penitentiary in the basement. 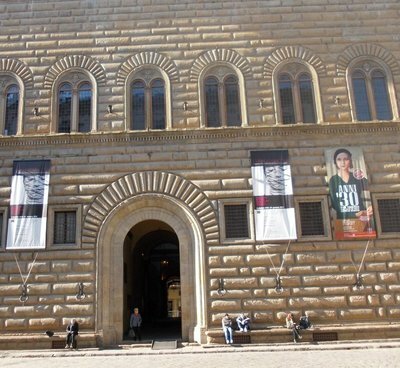 It is now a museum, the Pope having moved to the Vatican about 1929 when the Vatican became a separate state. We will tour the Castel Sant Angela museum tomorrow as our second use of the Rome Card which gives you two free entrances in Rome, but not in Vatican City. Our guide brought us to St Peters Square and explained how the Pope did his Sunday greeting from the second window on the right and if the window was open you knew the Pope was in residence. In the summer he goes to his summer place. We tipped the guide, had our apple juice and a snack sitting on a bench in St Peters square and then went to find the Vatican Museum which turned out to be quite a hike. Vatican Museum - The line-up was non existent, it was now about half past noon so we went through the security entrance and bought our tickets: fifteen euro each. 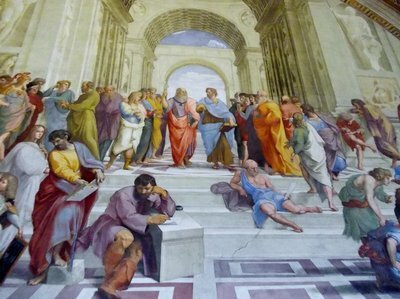 We went to see Raphaels work including his masterpiece the School of Athens. The colours are so vivid in Raphael's paintings it is like the figures are three dimensional and the book, for example, is coming out of the wall. There are corridors of sculptures and I took some pictures of feet to prove my point from Florence that the feet and everything else are really detailed even though they are carved from marble. There are maps, antiquities, tapestries, paintings, sculptures, it is huge. We did not look at everything and pretty much skipped over the modern stuff. Then we headed into the Sistine Chapel and were amazed by the Michelangelo paintings on the ceiling and walls, other artists are represented here as well. We did manage to get out the right hand door as suggested by Rick Steves and all kinds of other travel posts. We could not find a tour group to hook up with but just headed out when nobody was looking and this exit put us very close to St Peters Basilica where St Peter is suppose to be buried. We have already seen the burial spot of Saint John in Selcuk (Turkey) and really that was pretty much a thrill. St Peter's Basilica, being a church, is free. 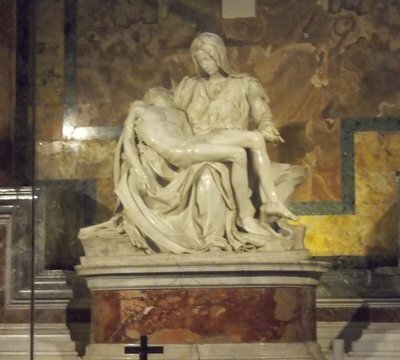 Here, behind glass and quite a distance from the admirers, is Michelangelo's marble Pieta. Mary holding her adult son Jesus, lifeless in her arms, it is very moving, the color is a wonderful warm ivory, very beautiful. Words cannot describe it really, you have to see it. Also Michelangelo designed the dome and the church is marble, gold, bronze, paintings everywhere, sculptures, and you can take pictures here as well. The only place you cannot take a picture is in the Sistine Chapel, the Japanese have the rights to the pictures, go figure. Now we went to the Peoples Square, Piazza del Popolo, and enjoyed the wonderful fountains and the ambiance, sitting on a marble bench with a light misty rain. The Egyptian obelisk is pink and is about four thousand years old. Then we went to the Republic metro stop to find St Suzannas church so I could pick up the passes for our audience with the pope tomorrow. A donation is requested so I did leave them about ten US dollars, it is an American RC church, they fly the flag and everything. Then home. We did stop once on our way for a cappucino and a light snack but this day was very intense with walking, we can hardly navigate anymore, we are really worn out, about six hours of steady walking today. At least tomorrow we can sit during the pope's service and I am really looking forward to that. It is not every day that we get to see a king, a head of state and have a guaranteed seat. I wouldn't be able to get that close to Harper. They suggest you go two and a half hours early to get a good spot but that is not going to happen. The Vatican is a rich little state, the world's smallest country, less than nine hundred people. Imagine. Right in the middle of Rome. We walked into St Peter's Square at 930 am. Tickets for our free admission in hand, we were directed to the end of a three block line. The audience is inside today. It is gorgeous weather, warm and sunny. I do not need my jackets. Plural. I am wearing my raincoat and fleece. The line moved quite fast, we were behind a Spanish bride and groom. She had a satin dress and wore a mantilla. The current Pope's name is Benedict XVI and I had to look that up, it is not just off the tip of my fingers. He was born in Germany near the Austrian border in 1927, so not a spring chicken. He will be 85 in April 2013. Imagine, at that age, to be the in charge of over one billion Catholics worldwide. By 10 am we were sitting in the chapel/auditorium quite close to the front. There were maybe 100 people in front of us and 6000 beside and behind us. Just the way people got streamed in from security, we were lucky. I really did pinch myself, I was so in awe of being there. I cannot imagine how the Catholics felt. 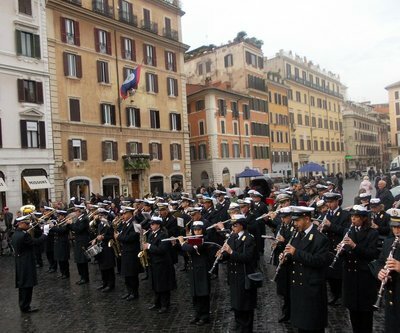 At about 1030 the orchestra played a tune, then two Swiss guards came onto the stage and stood on either side of the throne. Dressed in gold and purple, the Swiss guards have been guarding the Vatican for over 600 years. There were already about two dozen cardinals sitting on the right hand side of the stage. Then, in a wave, everybody in the audience/congregation, stood up, like you do at a wedding, and the crowd erupted. Jeff leaned over to me and said, 'The pope is like a rock star' and I was clapping along with everybody else when the small old man with white robes and a crown of thick white hair came out on the stage. He said a few words and raised his arms, he was speaking Italian so ....Then we all sat down and people were snapping pictures to beat the band. A cardinal read a passage from the letter by Paul to the Corinthians. I know this as it was read in several languages including English. Then the pope, who remained sitting in a big chair with two cardinals in smaller chairs on either side of him and the two Swiss guards standing on either side of the cardinals, then the pope, as I was saying, gave a sermon. It was in italian (or maybe Latin) but I could understand the gyst of it, God, Jesus and Paul, antagonistic, the service revolved around the Bible passage. Then one after the other, cardinals spoke. In English, the pope would bless members of our families who were sick, then the pope spoke in heavily accented English, well he read something and there was polite applause. He mentioned England, the states and Sri Lanka. I had a hard time understanding him but he was basically bringing greetings, welcoming the 'English as a first language' attendees. Then the same thing was repeated in German, polite applause. When the pope spoke in Spanish there were boisterous cheers and again when he addressed the Portugese speakers, loud cheering and waving of flags. The Italians waved white handkerchiefs. But it was the Polish segment of the audience who stole the show. A group with red head scarves stood up while the pope was speaking Polish and started singing, the Poles scattered around the huge auditorium were clapping along to the tune. It was quite a long song and when it was finished the pope resumed talking and right away another group started singing, interrupting him for the second time. When we went on the walking tours of Warsaw and Krakow, it was so evident that Poland is a Catholic country and they were so proud of the Polish pope, John Paul ll. There were a few more languages covered, but it was pretty subdued. Then the pope stood up and gave the Apostolic blessing, which also would cover our relatives and loved ones who are sick or in agony. and when he was finished the cardinals lined up and kissed his ring. The man on my right had wiped away a tear during the Polish singing so before we left I touched his arm (his back was towards me) and when he turned I asked ' are you Polish?' and of course he was, I said 'Canada' and shook his hand and he hugged me and kissed my cheek and for me this was a moment. I don't care if you are Catholic, Protestant or agnostic, today's papal audience was powerful, and we both are glad we came. Jeff and I left the chapel and proceded to Sant Angela's Museum. Which has a lot of stairs and some great views of Rome. Hadrian is buried here. Then it was a long walk to Piazza Fiori, yummy lasagna for lunch, nice square where they used to execute people, now it is a produce market, Campo di Fiori, narrow winding streets, artisan's shops, Sergios was closed (Ali from the Tulip Art Shop in Turkey had recommended this restaurant, likely opens for supper at 730), and we got home at five. We are staying at Christina's Residence, about four or five blocks from the main train terminal, cost is 34 Euros per night and includes breakfast which is set up in your room, you make your own instant coffee with the electric kettle provided and there is a fridge. Tomorrow we fly Ryanair to Madrid. Caio.